oh and He has an ULTI? I think a fair solution to this would be to update/buff Vader to match Anakin. They are sort of the same character and how Anakin's massive choke Ultra can oneshot infantry and Vader's choke is a joke is beyond ridiculous. 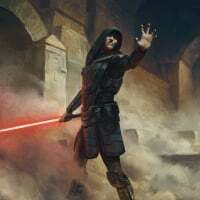 I'd say replace Vaders Focused Rage with a similar move to Passionate Strike, have Force Choke with 90% damage reduction, increased distance when damaged and give him the same Ultra as Anakin. Agree, Vader was known to have large hp pool and low mobility and iconic choke, but here comes Anakin who have Even more HP, good mobility, AND saber damage that can 1 shoot infantry, and his choke can kill whole enemy team with Anakin having 90% reduced damage while Vader cant even kill 1 troop with his choke... Something is vrong, dont nerf Anakin, buff all old Heroes like Kylo. sillysaxon, so you would rather have a boring game with nerfed heroes instead of a fun game with heroes that will be feared and can counter each other rather than dark side losing 24/7 because of anakin heroic mighting the **** out of choke points? I disagree. The answer is to nerf Anakin. No hero should be stronger than another. Ideally. Of course not possible to do that but it should still be the standard we are going for. Nerf Anakin? Dude be real! Heroes are not supposed to get 160 kills. It is fair that you have a chance as a regular trooper and have to play smart as a hero and actually be good at the game, unlike you who is probably a big whiny noob who thinks everything is bugged because you are bad at the game. anakin is broken in EVERY way. I though Palpy was OP'd. (Ahhh the nostalgia of it all), now they give us Anny the One Man Gang and he's WORSE! Is anyone on this dev team out of their twenties? C'mon guys Retribution and Passionate Strike for the SAME character? How did you figure that was in line with game balance compared to other heroes. Are they even Canon?? The radius needs to be reduced for both. I recall getting flattened by a heoric strike and I was no where near him, with crates and crashed fighters between me and him! His OP is killing the balance of the game and in particular H v V. Check the leader boards of each game and you'll see an Anny either at the top or at least 2nd in almost every game. I think he needs a time out like Palpy so he can be properly balanced. Those podium results are NOT good players, just an OP'd hero.